Announcement We are spring cleaning! All ready-to-ship signs are 20% off through April. Current shipping time is 1-2 weeks, excludes ready-to-ship items. In a rush? Add this upgrade rush fee to order and it will ship within 1-2 business days. All of our signs are distressed and we use REAL pine. If you are looking for something that is perfectly smooth without knots or character- we might NOT be the shop for you. Our signs DO have imperfections. As a small business, we work really hard picking the best boards and spend a LOT of time sanding and prepping to make a product we love and hope you do as well. We do NOT offer refunds because of knots in the wood. If you receive your order and it is damaged- we have to have pictures of the damaged sign and the damaged box. Send these pics to us and we will work to make it right. Add us as a favorite and follow us on Facebook or Instagram to see new items, sales and events we are doing. After more than 10 years of making signs, it is an incredible feeling to still get excited to do what we do. 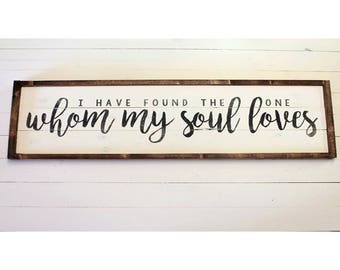 Inspired by a love of all things vintage, distressed and simple, our signs are handmade- each unique and perfectly imperfect. Whether purchasing to freshen up your own home or as a gift for that special someone, we enjoy creating unique, timeless pieces and are confident each will be enjoyed for years to come. Thank you for your loyalty and your business. A Simple Impression. All Rights Reserved. We are spring cleaning! All ready-to-ship signs are 20% off through April. A little work going on at the shop. Lots and lots of work going on around our shop. With a love of words, home and all things vintage we are lucky enough to do what we love... making signs and tees! 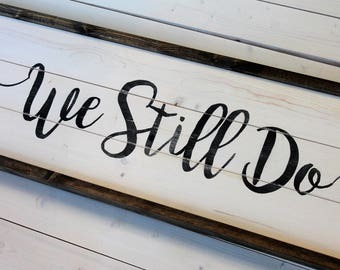 As a husband and wife team, we have been making signs for ten years! From sorting through thousands of boards picking out the best ones to designing, creating and shipping- we do it all! With a love for all things simple and vintage inspired, we use neutral colors and solid wood fitting in beautifully with any farmhouse, rustic or simple decor. As a husband-and-wife team, we work super hard to create and deliver a product our clients LOVE. From selecting the best boards to putting postage on packages, we handle every aspect of A Simple Impression. Outstanding customer service and a quality product are our focus. We want you to be delighted when you receive your package in the mail. If something is not right- please allow us the opportunity to make it right.